Almost all metals can be used in the metal injection molding process, with the exception of magnesium and aluminum. This is because of the adherent oxide film that will always be present on the surface of these powder particles. A problems as these oxide films inhibits the sintering step in the molding process. From an economic stand point, the most promising metal injection molding materials for the MIM process are the those that are more expensive. The reason for this is the fact that this process delivers almost no scrap. The metal powder that remains after molding is recycled and reused, offsetting the high cost involved in producing the metal powder. Note that finer powders are more readily sintered, while coarser powders are more difficult to sinter. Has a predominantly equiaxed or spherical particle shape. The particles are dense and free of internal voids. The particle surfaces are clean, aiding in interaction predictability. A sufficient amount of inter-particle friction in order to avoid distortion after the removal of the binder. Small particle sizes in order to aid rapid sintering. Metal powders has to have a tailored particle size. This will ensure a high packing density as well as a low cost. An ideal powder also has no agglomeration. When it comes to metal injection molding materials, binders are critical. 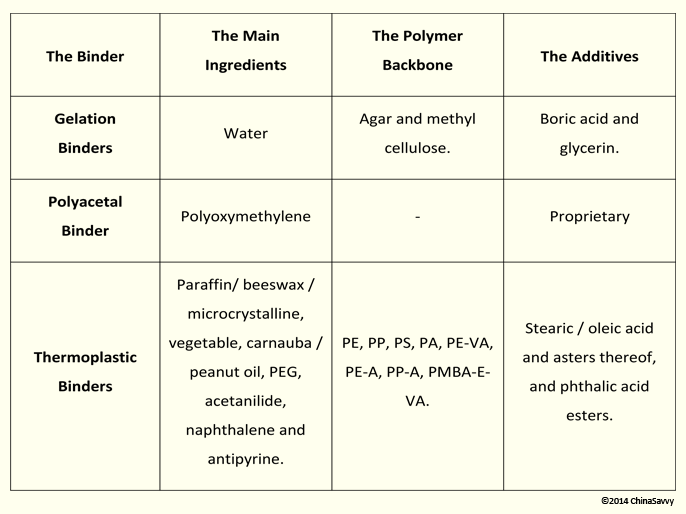 Binders are a mixture of organic compounds of which the main ingredients are synthetic polymers or natural waxes. Other substances are also added in order to modify its properties. Of all the materials used in injection moulding, binders should be used in the lowest amount possible. Note however that the appropriate volume fraction of powder will depend on the characteristics of the powder. A usual process within MIM is to convert the feedstock (which is the powder and binder mix) into solid pellets using granulation processes. Solid pellets can be fed into the molding machines as well as be stored for later use. It is vital that the binder does not deteriorate during the molding process as sprues, runners and rejected green parts undergo granulation processes for recycling and reuse. Another important aspect with binders is that binders should be easily removed from the molded part. This debinding step in the process can be time consuming and plays a major role when it comes to cost. The feedstock (the metal powder and binder) has to be of a consistent quality in terms of dimensional accuracy as well as material properties. MIM feedstock has specific properties and is is vital that these properties match the requirements set out for the manufacturer to meet. Seen as a property, the shrinkage from the mold dimensions to the final dimensions plays an important role. Testing will involve the production of a test sample and the shrinkage will be determined by measuring two diameters perpendicular to each other. Two type of homogeneity is identified, the first being the homogeneity as it relates to feedstock composition (the powder content of each feedstock pellet), the second being homogeneity associated with the dispersion of the powder in the feedstock pellets. The dispersion of the powder in the pellets are of lesser interest here, as it is eliminated during the injection and molding process. The powder content of each pellet is however very important. In order to test the powder content either liquid immersion techniques or gas pycnometry techniques are applied. When it comes to materials used in injection moulding, the viscosity of the feedstock used in the process, plays an important role. The viscosity of the feedstock will determine how well the material is transported into the die cavity - a low viscosity is associated with an easy flow of feedstock. Critical loading is also a vital factor when it comes to the formulation of feedstock. Critical loading is the limit of powder content above which the relative viscosity will significantly increase.